La noticia llega a través de las redes sociales. 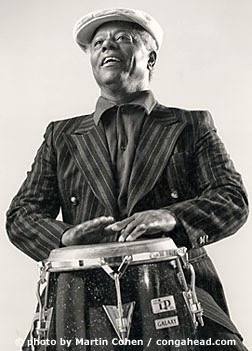 Otro de los pioneros de la conga cubana en el jazz de los Estados Unidos se ha ido. El Maestro Armando Peraza falleció ayer por la noche en un hospital de San Francisco. Peraza tocó con muchos grandes de la música: Kuvabana, Paulina Alvarez, Charlie Parker, Dizzy Gillespie, Machito, Josephine Baker, Cal Tjader, Art Tatum, Pérez Prado, Dave Brubeck, Eric Clapton, Linda Ronstadt, Frank Zappa, Rick James, Aretha Franklin, Jaco Pastorius. Sin embargo su nombre se vincula principalmente a George Shearing (de 1954 a 1966) y en los 70s a Carlos Santana. During most of my time with George, touring the U.S. was always littered with racial land mines, not always in the South. When we would travel by car, it didn't matter what part of the country, we would constantly get stopped and ticketed by the cops because of the mix of colors inside the car. It was against the law in a lot of States for race mixing and the Shearing band was one of the first integrated groups in the business. Many times we'd show up at a gig and the club owner, promoter or manager would freak out because they didn't know we were a mixed race band and would refuse to let us enter the club. That's when George would mess with these people. He would ask them what was the problem. The offender would say he can't have Black people in his club and George would then ask "What is a color?" Since George was blind from birth, technically it was true that he didn't know what the hell a color was, but George wanted to make the person explain their own racism to a person who couldn't see. The person would try and always fail to logically explain it and would eventually give in and let us play, especially when George would say 'If my musicians can't enter, then neither will I".